The Way We Were 1973 - 118 min. 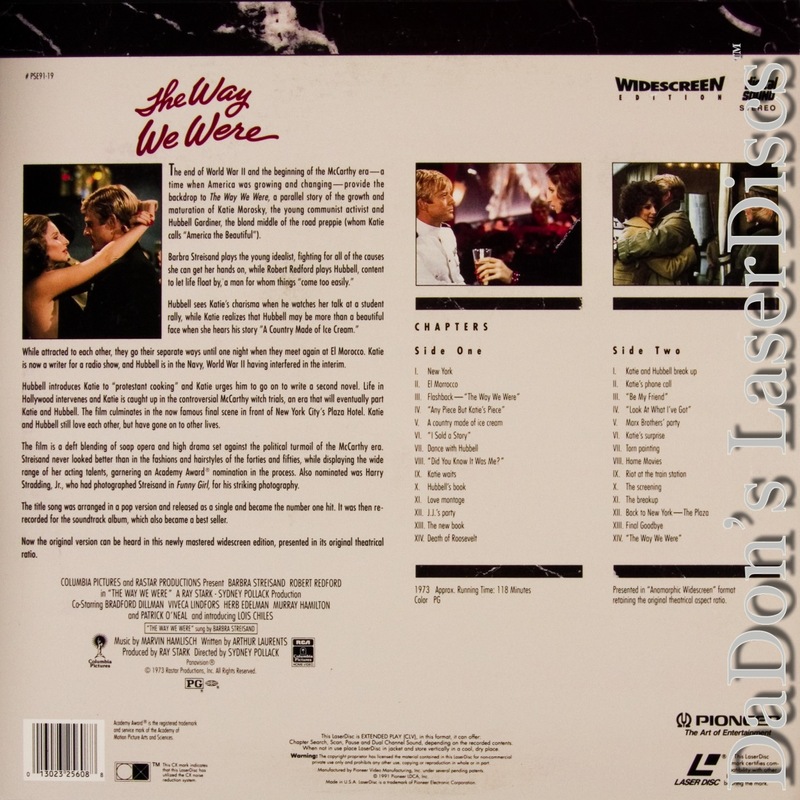 - Color Genre: Drama Rated PG Country: USA LaserDisc Movie Storyline: Sydney Pollack directs Robert Redford and Barbra Streisand in this sensitive and moving tale of the romance of two individuals whose political ideologies are exact opposites. Streisand won an Academy Award nomination for her performance as Katie Morosky, a Jewish student radical who falls in love with Hubbell Gardner (Redford), a conservative privileged writer. The two interact from the beginning of their college courtship through the Hollywood-blacklisting era of the 1950s. LaserDisc Movie Review: "Gorgeous goyish guy" meets Jewish radical girl in Sydney Pollack's glossy romance. In 1937, frizzy-haired Red co-ed Katie Morosky (Barbra Streisand) briefly captures the attention of preppy jock Hubbell Gardiner (Robert Redford) with her passionate pacifism, while the writing talent beneath his privileged exterior entrances her. Almost eight years later, the two are reunited in New York, when well-coiffed leftist radio worker Katie spies military officer Hubbell snoozing in a nightclub. Through her force of will, and in spite of his smug rich friends, the two opposites fall in love, sparring over Katie's activist zeal and Hubbell's writerly ambivalence after a failed first novel. They head to Hollywood so that Hubbell can write a screenplay for his buddy-turned-producer J.J. (Bradford Dillman). But the House Committee on Un-American Activities' Communist witch hunt in 1947 tears the pair apart, as a pregnant Katie refuses to keep silent about the jailing of the Hollywood Ten, while a faithless Hubbell decides to save his career. When the two meet again at the dawn of the '60s, TV hack Hubbell and A-bomb protestor Katie feel the old pull, but they have to decide if it's worth the grief. Although blacklisted writers had returned to Hollywood --- and won Oscars --- by the early 1970s, the HUAC sections of Arthur Laurents's screenplay were still considered dicey, resulting in substantial cuts; Laurents reportedly blamed star Redford for not fighting them hard enough. Regardless of the edits, and critics' complaints about the film's schlockiness, 1973 audiences went for the well-executed and still politically tinged weepie, turning The Way We Were into one of the most popular films of 1973 and Redford into a major heartthrob. Streisand won an Oscar nomination for Best Actress and the Streisand-sung title tune won for Best Song. Despite the eviscerated politics, The Way We Were poignantly captures the insoluble dilemma of reconciling private desires with public awareness. 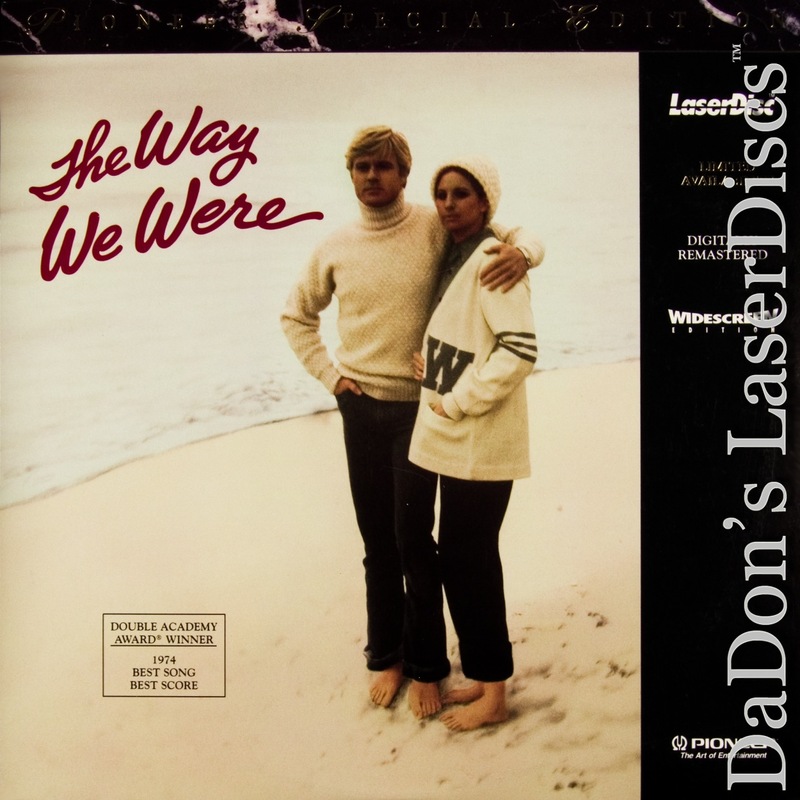 --- Lucia Bozzola An old-fashioned Hollywood melodrama with a progressive gloss, The Way We Were succeeds on the basis of the romantic chemistry between stars Robert Redford and Barbra Streisand. The film tackles the issue of commitment --- political, romantic or otherwise --- but it is the roller coaster love affair that's at the heart of the film. The sprawling script covers a lot of ground, and director Sydney Pollack occasionally strains under the weight of the material. Supposedly, some of Way We Were's more political scenes were cut by the studio, diminishing much of their impact and muddling the film's conclusion. Still, time and time again, it is the charisma between Redford and Streisand that floats the film over its rough spots. Streisand sang the title song, which won an Academy Award and became her first number one single. --- Brendon Hanley Thanks for Visiting DaDon's Rare LaserDiscs ! Reviews, Articles, Newsletter and Information for Movies on LaserDisc LD Laser Disc, LazerDisc.